You might have heard of Salon Schmitz on Aachenerstraße – if so, I bet somebody mentioned their extra special ice cream and sorbets. On hot days, you can wait in line for about thirty minutes just to get the chance to order your ice cream (I order coconut sorbet and salted caramel). Even the most amazing ice cream on the planet would make you question: is it really worth all that waiting? But we don’t have to wait anymore! A good 500 meters away from the well known Salon Schmitz on Aachenerstraße, the Schmitzies opened up another restaurant on Dürener Straße: Schmitz Eis. This one is smaller and lesser known – that is why you don’t have to wait that long. This restaurant was almost entirely created with the purpose of serving the most pleasant ice cream. 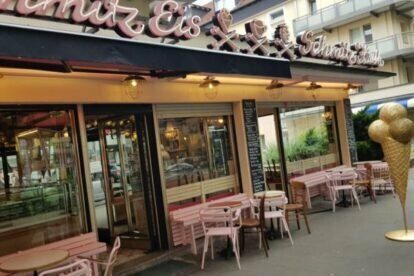 There is also a small “Schmitz” restaurant right next to it, but I prefer to grab a cone of pistachio sorbet and go for a walk around the Aachener Weiher (especially because the outdoor furniture is not that comfortable).